Aston Martin's teaser picture shows a mid-engined supercar layout. LONDON -- Aston Martin will reveal a concept car at the Geneva auto show that closely previews a forthcoming hypercar codenamed 003, a source close to the company said. 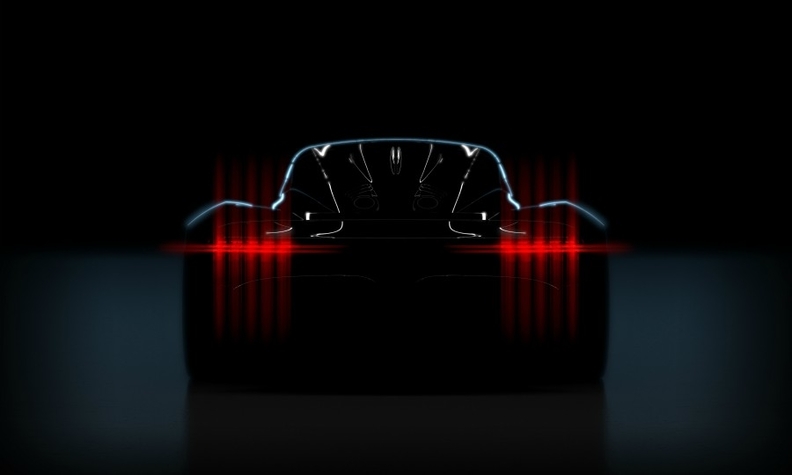 The UK luxury brand released a teaser picture of the mid-engine car that will go into production in 2021 and will be limited to 500 units. The car will rival the McLaren Senna and Ferrari’s replacement for its discontinued LaFerrari hypercar, Aston Martin has said. The 003 codename refers to the fact it will sit below the Valkyrie and the track-only Valkyrie AMR Pro flagship hypercars, due to go into production later this year. The new model "has its DNA deeply rooted in the concepts and technology" for the Valkyrie, Aston Martin CEO Andy Palmer wrote in a tweet Wednesday. No more information was available about the engine technology, but the Valkyrie is a hybrid model that mates Aston’s V-12 engine to a battery pack supplied by electric supercar specialist Rimac. The 003 is expected to cost less than the 2.4 million-pound ($3.1 million) Valkyrie and 4 million-pound Valkyrie AMR Pro. The two models are limited to 150 and 25 examples respectively. Both are sold out, Aston Martin has said. The 003 and Valkyrie models are leading up to Aston’s first volume mid-engine supercar, which will go into production in 2022, the company has said. "It’s about creating credibility and authenticity in that mid-engine segment that we've never played in before," Palmer told Automotive News Europe last year. The new supercar would rival models such as the Ferrari 488 and McLaren 720s and Aston expects to sell around 1,400 a year, the company said in its share prospectus last year. Also at Geneva, Aston Martin will show a Lagonda All-Terrain Concept, which previews the company’s first model in its electric Lagonda range, ahead of its production launch in 2021. A sedan will follow the SUV a year later.